A dual career as an illustrator and star puppeteer isn’t exactly a route to fame and fortune today, but back in the twenties and thirties, Tony Sarg pulled it off. And even if he’s no longer a household name, everyone knows Sarg’s biggest project: In 1928, he floated the idea of creating giant inflatable figures that could be paraded down Broadway and got Macy’s to try them out on Thanksgiving. (A few years later, he did the first set of the store’s animated Christmas windows, too.) Raised in Germany, Sarg popularized old-world marionette technique in the U.S., performing at the Chicago and New York world’s fairs and designing the latter fair’s official map. A master of branding before the word existed, he also opened a small chain of kiddie stores, and produced toys and books and puzzles by the carload until his death in 1942. 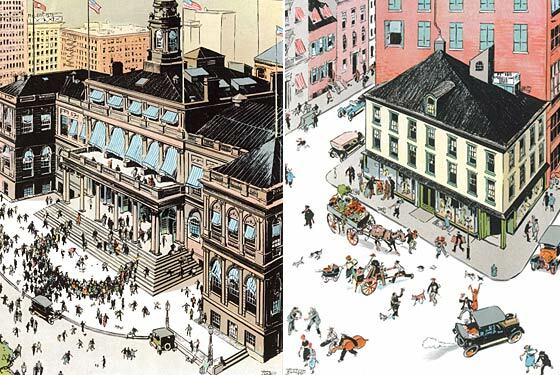 A remarkable volume by Sarg, Up & Down New York (Rizzoli/Universe, $30), returns to print this month. 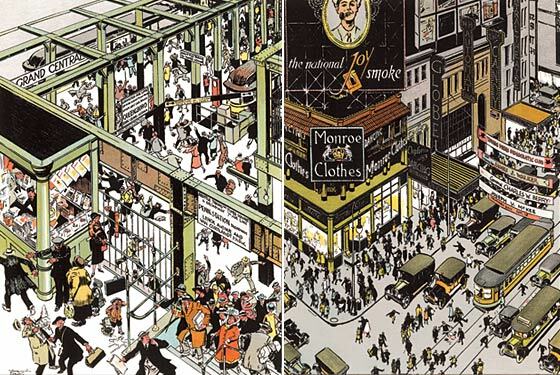 Its isometric bird’s-eye views are madly lively slices of the twenties boom city, packed with tiny, scurrying urbanites. Subtract all the hats, swap the Model T Fords for Honda Civics, and many of these scenes could be yesterday. Sarg’s work has been compared to that of Red Grooms, but these not-just-for-kids illustrations also evoke those wonderfully busy Richard Scarry books, or even the Where’s Waldo? series—the kind of images that keep one staring at each page for far longer than ought to be possible in the age of ADD.